Following his critically acclaimed new album "Thank You Mr Churchill", Grammy® winning guitarist and songwriter Peter Frampton will tour the UK this November in celebration of his multi-platinum-selling live album "Frampton Comes Alive!" 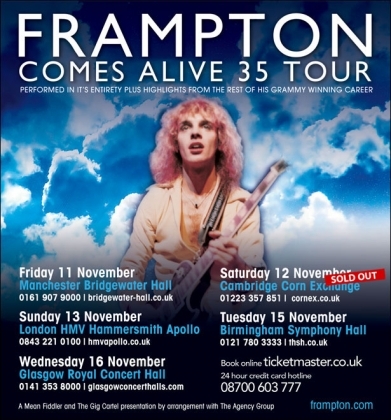 The tour will see Frampton perform the legendary double live album in its entirety. The 3-hour show will feature a complete performance of Frampton Comes Alive! including the singles Baby, I Love Your Way, Do You Feel Like We Do and Show Me The Way, along with highlights from Frampton's extensive album catalogue. Originally released in January 1976, Frampton Comes Alive! is one of the best-selling live albums in chart history. It spent a total of 10 weeks at the top of the American Billboard 200 and sold over 17 million copies worldwide.